Several conservation organizations contend that a recently completed plan for sage grouse management in Wyoming does not bode well for similar plans throughout the West. Because of a court-ordered settlement, the U.S. Fish and Wildlife Service has until September 2015 to decide whether to add greater sage grouse to the endangered species list. Doing so could result in tight restrictions being placed on development and livestock grazing on sage grouse habitat throughout the West. The pending deadline has prompted the BLM and U.S. Forest Service to update land-use plans to better conserve sage grouse and preclude listing the species. The BLM has divided sage grouse range into 15 planning areas across 11 Western states. Final resource management plans for each area are expected to be released over the next few months. One of those is a plan for Idaho and southwestern Montana. A draft plan was released in November and a final plan is scheduled for release this fall. The first finalized plan to include new measures to address sage-grouse protection was for west-central Wyoming, and was released by the BLM’s Lander Field Office on June 26. 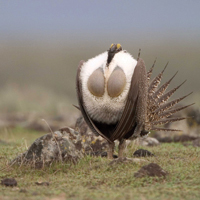 “The Lander plan utterly fails to do what’s needed to stem the decline of sage grouse in this part of Wyoming, making it more likely that these birds will require the protection of the Endangered Species Act,” said Travis Bruner, executive director of Western Watersheds Project. The Hailey-based organization was one of six conservation groups that on Aug. 18 submitted to the federal Interior and Agriculture departments a 32-point checklist of measures they consider necessary to be undertaken on federal land to protect sage grouse. The checklist has specific direction related to habitat identification, vegetation management, livestock grazing and mineral and gas development. The groups proposed that grazing regulations require at least 7 inches average grass height in nesting and brood-rearing habitat, leave a four-mile buffer around breeding leks, prohibit grazing during breeding and nesting, and seasonally remove livestock from late brood-rearing habitat to allow regrowth of native grasses. The checklist states that limited winter grazing may be appropriate as long as it leaves enough residual grass height prior to the next breeding season. In an accompanying letter to Secretary of the Interior Sally Jewell and Secretary of Agriculture Tom Vilsak, the groups said their proposed checklist is based on recommendations made by the two department’s own experts. “Unless the agency changes course and starts following the best available science, we are headed for continuing controversy as a result of ineffective management plans, and declining grouse populations,” said Steve Holmer, senior policy advisor for the American Bird Conservancy, in a news release. In an interview, Western Watersheds Project Director Bruner said that while his organization advocates that livestock grazing be entirely eliminated from sage grouse habitat, management plans should at least restrict that use to specific dates. He said sage grouse scientists recommend that livestock not be turned out into sage grouse habitat until after June 20 and be removed by Aug. 1 to allow for herbaceous regrowth and provide cover to benefit sage grouse the following spring. To protect winter sage grouse habitat, he said, winter grazing should be restricted to Nov. 15 to March 1. The Idaho and southwest Montana plan states that livestock grazing seasons should be modified “to provide greater flexibility in managing livestock” for the benefit of sage grouse. Bruner also said use of herbaceous vegetation by livestock should be limited to 25 to 30 percent of annual production. “This limit is critical for nest success, a key component of conserving and recovering sage grouse,” he said. According to the conservation organizations, as many as 16 million greater sage grouse once ranged across 297 million acres of sagebrush grasslands in the western United States. Over the last two centuries, development, livestock grazing and—more recently—oil and gas drilling have reduced sage grouse populations to several hundred thousand birds. In the face of ongoing habitat destruction and other threats, the groups say, the species’ population continues to decline.